Every week, the AV Technology team puts the week's proAV news in context. These candid conversation-starter are designed for tech managers and presented by technical advisor, Justin O'Connor. 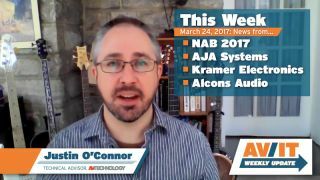 In Episode 4 [03.24.17], Justin reviews news from the latest updates from the 2017 NAB Show, AJA Systems, Kramer Electronics, and Alcons Audio.